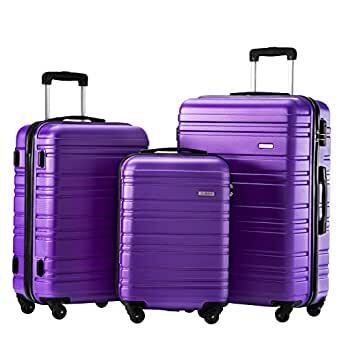 Three piece luggage set 20 inch,24 inch,28 inch upright,can be stored one into another. Spinner wheels,multidirectional smooth and silent 360Â°wheels. Sturdy ergonomic aluminum telescoping handleï¼secure combination lock. Weight Capacity:Â 20inch: 33 lbs, Â 24inch: 44 lbs, 28inch: 55 lbs.